It’s been years, even decades, since watching Robert De Niro attempt comedy could be counted as any kind of novelty. 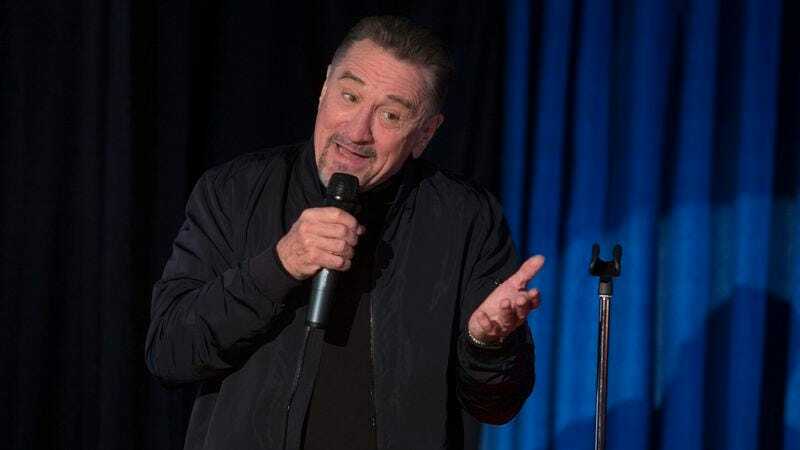 But it’s still strange to consider the way De Niro has developed a parallel career as an awkward comedian, from his unhinged aspiring stand-up in The King Of Comedy to the self-parodying shtick of Analyze This to his unexpectedly recurring gig as a stiff but game Saturday Night Live host and drop-in. De Niro’s role in The Comedian is more straightforward. The conception of Jackie Burke, a foulmouthed stand-up comic at a career dead end after a successful but pigeonholing sitcom gig, never winks at the legendary actor’s past, either in dramas or comedies. Even so, the uncomfortable yet not unwelcome spectacle of De Niro attempting zingers makes this movie an essential subject for future study of the actor’s comic side. Unfortunately, it is essential in no other way. The Comedian comes on like a redemption story, minus the crucial ingredient of desire to be redeemed—something both the main character and the filmmakers seem to lack. Jackie’s late-career crisis is somewhat incited by a poorly attended nostalgia show (other performers include Jimmie Walker and Brett Butler) where he winds up decking an audience member, but the movie throws in so many mitigating circumstances that it can’t see any hubris behind Jackie’s righteousness. As Jackie serves a short prison sentence (mostly off screen) and emerges to complete 100 hours of community service, he does his routines, kind of an ongoing roast with some Rodney Dangerfield-ish self-deprecation thrown in, for anyone who will listen. Over the course of the movie, those audiences include homeless people, residents at a retirement home, a courtroom, all of the guests at his niece’s wedding, and Harmony (Leslie Mann), who is completing her own community service sentence at the same church as Jackie. She thinks he’s funny, which is made clear by her repeatedly saying so, and she’s not the only one. Multiple other characters tell Jackie how funny he is, and the movie’s litany of reaction shots, even during Jackie’s most outrageous material, skews about 85 percent shocked delight, leavened by only the occasional shot of a frown or a grimace. It’s another way that director Taylor Hackford frames Jackie as beyond reproach. Even at his worst, the majority of the room tends to get on his side, and the movie forgets to supply a reason that he’s washed up in the first place. Because The Comedian never digs into the psychology of this foulmouthed envelope-pusher who resents his mainstream sitcom success, it forces Jackie’s comedy to carry an undue burden: If he’s funny enough, maybe the movie could work. In other words, the fate of this movie rests on Robert De Niro’s ability to play a compulsive cut-up. He’s not bad here, though no one dismayed by his transition into working-actor mode will recover their faith. On stage, De Niro’s Jackie is passable, but the actor isn’t a natural fit for a guy whose comic instincts are supposed to dominate every aspect of his life. While De Niro can summon movie-star charisma with mannerisms and familiar aspects of his persona (that squint, that curmudgeonly reluctance), he’s basically a naturalistic actor—almost too honest and grounded to play someone who is compulsively, actually funny. Jackie’s jokes, even the ones that are supposed to shoot spontaneously from his brain to his mouth, sound canned; Rupert Pupkin’s sweaty desperation was, in its creepy way, funnier. For that matter, Leslie Mann is funnier in this very movie, whether she’s downplaying the sentimentality of watching Jackie’s old sitcom with her dad (“We just had the one TV”) or enthusing “I love her!” after nearly getting into a physical altercation with Jackie’s sister-in-law (Patti LuPone). Then again, De Niro hasn’t exactly been furnished with ace material. 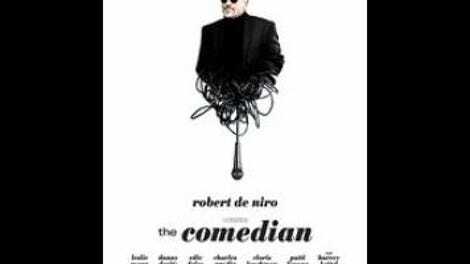 The screenplay for The Comedian includes seemingly disparate credits for Hollywood vet Art Linson (who De Niro more or less played in What Just Happened), touchy-feely expert Richard LaGravenese, and roast obsessive Jeff Ross, along with comedy writer Lewis Friedman. The cast is an equally odd mix of Scorsese alumni (Harvey Keitel plays Mann’s dad), real-life stand-ups, former De Niro comedy partners (both Charles Grodin and Billy Crystal appear), and Danny DeVito. Despite the variety on screen and off, most of the scenes are pretty similar: Jackie enters, makes some jokes, sometimes gets mad, and leaves. The biggest variation is whether the movie shows full stand-up routines or just conversational snippets. In other hands, Jackie’s compulsion for one-liners and inability to change in a meaningful way could have been bracing. Here it makes The Comedian prone to long, rambling scenes. Someone like Jonathan Demme might have been able to steer through this movie’s protracted wedding sequence and find the humanity in its surfeit of unnecessary characters, but Hackford is not someone like Jonathan Demme. The director may be classier and De Niro’s joke rhythms may be more traditional (often musty), but The Comedian is really just offering yet another movie-world, irreverent old man who speaks his mind no matter who he offends. Beneath the unearned, would-be pathos, Jackie is a Dirty Grandpa character who channels all of his vulgarity into his profession. He forces audiences into the role of shocked Zac Efron straight arrows, while the movie congratulates itself on its manufactured edge.